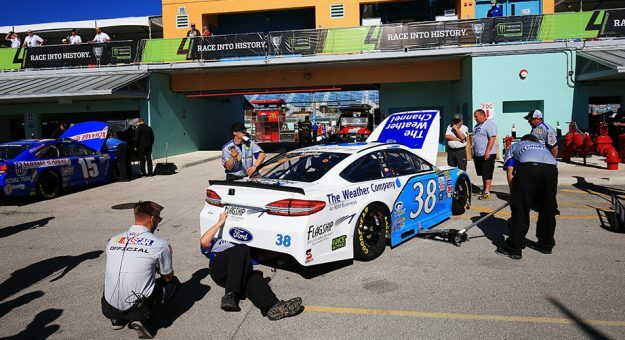 NASCAR competition officials distributed a handful of competition updates Wednesday, most notably regarding the damaged vehicle policy and the national series qualifying format. The time limit for teams to make repairs will increase from five to six minutes. Furthermore, if a team has too many crew members over the wall while its car is on the crash clock, the team will be assessed a two-lap penalty instead of being parked. NASCAR officials said those changes were developed from discussions with stakeholders, building on lessons learned from last season to better fit the spirit of the initiative. Competition officials also reduced the opening round of knockout-style qualifying at intermediate and short tracks from 20 to 15 minutes, offering a tighter window for the field to make initial qualifying attempts. The news comes on the heels of NASCAR’s competition department setting the stage lengths for races in all three national series. The group also indicated the NASCAR Air Titan track-drying system will have a revised look in 2018, with a red-and-white scheme replacing the silver-and-green livery.